O excellent Doctor, light of the holy Church, blessed Cyril, lover of the divine law, pray to the Son of God for us. O God, who didst give to thy people blessed Cyril, for a minister of eternal salvation; grant, we beseech thee, that he who was the instructor of our life here on earth, may in heaven become our intercessor. Through our Lord Jesus Christ, thy Son, who liveth and reigneth with thee, in the unity of the Holy Ghost, God, world without end. Amen. 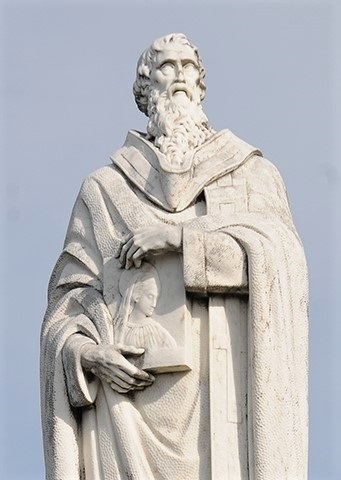 St. Cyril was raised by God to defend the faith of the Incarnation of his Son, “of which mystery he is styled the doctor, as St. Austin is of that of grace,” says Thomassin. He studied under his uncle Theophilus, and testifies that he made it his rule never to advance any doctrine which he had not learned from the ancient Fathers. His books against Julian the Apostate show that he had read the profane writers. He often says himself that he neglected human eloquence: and it is to be wished that he had written in a clearer style, and with greater purity of the Greek tongue. Up on the death of Theophilus, in 412, he was raised by the people to the patriarchal dignity. He began to exert his authority by causing the churches of the Novatians in the city to be shut up, and their sacred vessels and ornaments to be seized; an action censured by Socrates, a favorer of those heretics; but we do not know the reasons and authority upon which he proceeded. He next drove the Jews out of the city, who were very numerous, and enjoyed great privileges there from the time of Alexander the Great. Seditions, and several acts of violence committed by them, excited him to this, which grievously offended Orestes the governor, but was approved by the emperor Theodosius: and the Jews never returned. St. Cyril sent to conjure the governor by the holy gospels that he would consent to a reconciliation, and that he would join in sincere friendship with him: but his offers were rejected. This unhappy disagreement produced pernicious effects. Hypatia, a pagan lady, kept a public school of philosophy in the city. Her reputation for learning was so great, that disciples flocked to her from all parts. Among these was the great Synesius, who afterwards submitted his works to her censure. She was consulted by philosophers of the first rank on the most intricate points of learning, and of the Platonic philosophy in particular, in which she was remarkably well versed. She was much respected and consulted by the governor, and often visited him. The mob, which was nowhere more unruly, or more fond of riots and tumults than in that populous city, the second in the world for extent, upon a suspicion that she incensed the governor against their bishop, seditiously rose, pulled her out of her chariot, cut and mangled her flesh, and tore her body in pieces in the streets, in 415, to the great grief and scandal of all good men, especially of the pious bishop. He had imbibed certain prejudices from his uncle against the great St. Chrysostom: but was prevailed on by St. Isidore of Pelusium, and others, to insert his name in the Dyptics of his church, in 419: after which, pope Zozimus sent him letters of communion. Nestorius, a monk and priest of Antioch, was made bishop of Constantinople in 428. The retiredness and severity of his life, joined with a hypocritical exterior of virtue, a superficial learning, and a fluency of words, gained him some reputation in the world. But being full of self-conceit, he neglected the study of the Fathers, was a man of weak judgment, extremely vain, violent, and obstinate. This is the character he bears in the history of those times, and which is given him by Socrates, and also by Theodoret, whom he had formerly imposed upon by his hypocrisy. Marius Mercator informs us, that he was no sooner placed in the episcopal chair, but he began to persecute, with great fury, the Arians, Macedonians, Manichees, and Quartodecimans, whom he banished out of his diocese. But though he taught original sin, he is said to have denied the necessity of grace; on which account he received to his communion Celestius and Julian, who had been condemned by the popes Innocent and Zozimus, and banished out of the West by the emperor Honorius, for Pelagianism. Theodosius obliged them to leave Constantinople, notwithstanding the protection of the bishop. Nestorius and his mercenary priests broached also new errors from the pulpit, teaching two distinct persons in Christ, that of God, and that of man, only joined by a moral union, by which he said the Godhead dwelt in the humanity merely as in its temple. Hence he denied the Incarnation, or that God was made man: and said the Blessed Virgin ought not to be styled the mother of God, but of the man who was Christ, whose humanity was only the temple of the divinity, not a nature hypostatically assumed by the divine Person; though at length convicted by the voice of antiquity, he allowed her the empty title of mother of God, but continued to deny the mystery. The people were shocked at these novelties, and the priests, St. Proclus, Eusebius, afterwards bishop of Dorylaeum, and others, separated themselves from his communion, after having attempted in vain to reclaim him by remonstrances. His homilies, wherever they appeared, gave great offence, and excited everywhere clamors against the errors and blasphemies they contained. St. Cyril having read them, sent him a mild expostulation on the subject, but was answered with haughtiness and contempt. Pope Celestine, being applied to by both parties, examined his doctrine in a council at Rome; condemned it, and pronounced a sentence of excommunication and deposition against the author, unless within ten days after notification of the sentence, he publicly condemned and retracted it, appointing St. Cyril as his vicegerent in this affair, to see that the sentence was put in execution. Our saint, together with his third and last summons, sent Nestorius twelve propositions with anathemas, hence called anathematisms, to be signed by him as a proof of his orthodoxy, but the heresiarch appeared more obstinate than ever. This occasioned the calling of the third general council opened at Ephesus, in 431, by two hundred bishops, with St. Cyril at their head, as pope Celestine's legate and representative. Nestorius, though in the town, and thrice cited, refused to appear. His heretical sermons were read, and depositions received against him, after which his doctrine was condemned, and the sentence of excommunication and deposition was pronounced against him and notified to the emperor. The Divine Office for the use of the Laity, Volume I, 1806. February 9, 2019: St. Apollonia, Virgin and Martyr. St. Cyril of Alexandria, pray for us.